A great way for any creative person to show off their work. In this .PSD you can create your own fully customisable desk environment where you can display your own, or your clients work. You basically have endless ways to style it. •	All items can easily be moved around as you like. •	All devices and posters uses Photoshop Smart Objects. •	Desk sides are draggable so you can resize the desk surface as you please. •	7 different desk surfaces for the desk is included. •	5 different desk shapes is included to make the desk fit your style. •	Change the background as you like. Maybe snap a photo of your own wall, and use that. •	Folder-layers with “( c )” in their name, have a color mask inside, so you can change color easily. •	Folder-layers with “( + )” in their name, have extra features. Open folder to discover. •	Folder-layers with “( r )” in their name, can be adjusted in height or length. Open the folder to discover more. •	All logos on devices are removable (Just open the device folder and hide the “logo” layer). •	4 types of table legs are included. •	3 different types of chairs can be placed in front of desk. •	Guy sitting in the chair is included. •	Woman sitting in the chair is included too. •	16 desk plants added from plant image expert Envirographic. •	16 light filters added from best-seller FilterGrade.com. •	Color mask for background. Set any color you like as the background. •	9 high quality background textures is included, thanks to Marie from Mousemadedesign.com. •	Mockup Frame Creator included – 22 Poster frames. •	Header image templates included for Facebook, Google+, Twitter and Creativemarket. Huge bonus including 5 individual scene creators, social media header images, Photoshop Filter Action and more. Software compatibility: Adobe Photoshop CS 4 and newer. File size is approx 1.4GB (3.2GB GB unzipped), offered as a single download, as well as a 2 part download. It would be such a pity if the resolution of this scene creator is actually only 1500*1000 pixel and I almost can’t imagine it. It’s so lovingly and laboriously designed and would be by far the best tool of its kind, but is ultimately useless in both worlds (in times of Retina Displays and Hero Images coming in sizes of 1920*1080 and more or in terms of usage in the print sector) if the mentioned resolution is correct. Would it be possible to ask the creator if a high-res version of this bundle is also available? I would also be willing to pay a surcharge as it is basically a great product. However, the low resolution is a real dealbreaker for me at the moment, as the results produced would not be suitable for crop & resize, nor for reasonably large prints. Even with a 1:1 image the use as fullscreen header would not be possible in satisfactory quality. I find the information about the resolution of the .PSD a quite relevant information, which belongs in the product description or feature list. This should definitely be added, since it is certainly not only for me, but also for many other prospective buyers a crucial point. Other tools of this kind usually have resolutions of at least 4000*3000 or higher. I would expect the same with a product of such high quality as this. It was only by chance that I stumbled across the resolution information in the comments, which proved to be a disappointment and fortunately kept me from buying. So please please tell me that the resolution is higher and I will buy it immediately and recommend it on my network. Thank you so much for your comment on the MockUp Scene Creator and I can definitely help with your query! So this product was actually released in 2016 and at the time of release the file sizes were 1500*1500 but as you may have seen in some of the comments, we reached out to the designer and higher res files were added as, like you mentioned, the lower res files just aren’t suitable for print. How do I get the Christmas and Fancy, etc add-ons? I just recently purchased this and was wondering if there was a way to get those files. Thank you so much for reaching out to us Medinaj! I’m so sorry for any confusion caused by your updates for the Mockup Scene Creator! The great news is that as you picked up this pack in our Marketplace, you should receive these updates automatically so that you can re-download your updates at your convenience. I thought I had already purchased this mockup in a prior bundle, but I see no mention of this in the product info. I thought DesignCuts mentions if an item had already been sold prior on this site. Can anyone verify please? Thanks. Thank you so much for taking the time to reach out to us and we’re so sorry to hear that you find this one a little familiar. Rest assured we do list on our product page if any of our products have been featured in a previous bundle and I have just double checked this on our side for you so rest assured, this particular Scene Creator has not been featured before. Are there any updates in this file compared to when I purchased it in the past spring? Thank you so much for reaching out to us, we’re so sorry for any confusion caused! r=Rest assured I have popped you over an email to help! What are the dimensions of the poster frames? Thanks! I was looking for a mockup to show a 16×20″ poster, but with some quick math and the transform tool, I was able to make one of the provided frames work. There’s so much content in this! I look forward to playing with all of it. I’ve been reading the comments, are the High Res question solve in this edition? for the same price of $35? Is there any time expiration period on this bundle? I’ve bought in July the The Gigantic Mockup Templates Bundle, can i use some of the items in that bundle combined with this one? Best regards, and congrats for the great work putting all of this together! Our Marketplace items are also available for purchase indefinitely, so there are no expiries on these. You can definitely use these resources with any of your other purchases Ivo, dependant on what you are hoping to achieve, so i’ve just popped you over an email with regards to this! Would it be possible to confirm the resolution of the images? I have used the Place.to mock ups before and while they did look really beautiful, the resolution wasn’t good enough to zoom and recrop, even a small amount. If you could confirm that would be great, I’m really hoping to get this! Thank you so much for your comment- I can definitely help you with this! There are 3 landscape frames included in this pack, a hanging frame, a medium frame and a small frame, however they are all in black. Thanks for the lovely feedback on this one and I am so pleased to hear that you like this one :). Is there any possibility of a scene creator that would include living room or bedroom furniture? In particular I’d love something where I could feature my own throw pillows on chairs or a bed. Thanks! I hope this helps, Peggy, and please don’t hesitate to contact me should you have any other questions. I’m always happy to help! This mockup is fantastic and I’m thinking of buying it. However, as Peggy mentioned, and being an artist I would love to have some more furniture, plants and overall room decor to fit my large canvas paintings (no frames). How about that? Thank you so much for coming back to Ben! Hello! This looks excellent and I am very interested. However, I have a much older version of Photoshop. What is it about these elements that make it not usable on older versions? I assumed they were just transparent psd? gifs? and could be layered. But maybe not? Could I use the elements with older Photoshop… just maybe not be able to do certain things? Also, what mostly interests me is being able to add my own elements (say, my own coffee mug) to the desk arrangement. Would that be possible? Thanks in advance. When this price will expire? I can see few people disappointed with the resolution. Any news about it? Thanks for your comment! I can certainly help you out with your queries 🙂 I’m happy to confirm that this price will not expire and this item will be staying in our marketplace for a while 🙂 I’m also happy to confirm that the high resolution files for this item have also been added as well. I hope this helps, Roberto, and please don’t hesitate to contact me should you have any other questions. I’m here to help! I am very interested in this product but have a small question before I go ahead and purchase it. Will the technology pieces such as the MacBook be updated to the latest versions (i.e. new mackbook pro with touch bar)? In orther words, should we expect updates of the product when we buy it? Thank you for your lovely comment 🙂 It is fantastic to hear how happy you are with your purchase! 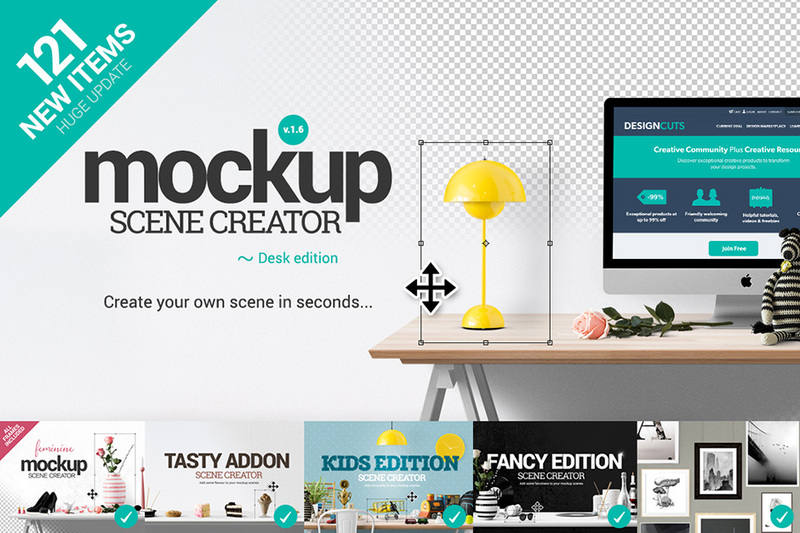 We hope this Scene Creator pack makes a great addition to your creative toolkit! Thanks again for your suggestion, Sonia! If you have any other queries please do let me know. I’m here to help! Thank you for your comment, I am so sorry for any inconvenience caused with your Scene Creator purchase! I can certainly investigate this further for you and enquire if there was a higher resolution updated available for this item – I have sent you an email to assist you with this. I hope this helps, Lena, and I apologise for any inconvenience caused. Please don’t hesitate to contact me should you have any other questions. I’m always happy to help! Any chance there’s an update for this? If not, this purchase has been a complete waste of money. I understand Ben was looking into this, to see if we could hold of any higher res files, however there aren’t any that come with this pack I am afraid. My sincerest apologies that you feel this is a waste of your money without these! I’ve popped you over an email to go through this with you in more detail. Quality bundle here, no doubt about it; the amount of customisability and flexibility offered, plus the bonuses, are really great. But I’m afraid I’ll have to express disappointment in it not being as “high resolution” as I expected. From the previews, I assumed I could take close-ups (not crazy extreme close-ups, maybe just even 200% zoom) of the items on the desk and have them remain sharp; unfortunately they don’t look good outside of the default size, especially not on retina display. That said, may I ask if this bundle (or at least just the main scene creator) is available for purchase at an even higher resolution? I can’t seem to find the Premade ePostcard from the Christmas Scene Creator (not in any of the folders or .PSDs) that’s featured in the preview? Is it part of the bundle? Thank you very much for getting in touch with your feedback, I really appreciate you taking the time. I am so sorry for any disappointment caused with this item but rest assured, I can certainly look into this and see if there is a higher quality version of these resources available! I have also sent you an email to help get you up and running with your premade postcards from the Christmas Scene Creator as well. I hope this helps, and please don’t hesitate to contact me should you have any other questions. Apologies again for any inconvenience caused. I just purchased this and the PSD file is not high resolution as stated… Can I get that file? Thank you for commenting, I am so sorry for this inconvenience with your Scene Creator files! These are the highest resolution files that we have received from the designer but rest assured, I can certainly investigate this further to enquire if there is an update for this item. Apologies again for this inconvenience, David. I am on the case to look into this for you but if you have any queries please do let me know. I’m here to help! Yes, if you wouldn’t mind asking the creator for the high resolution files, that would be much appreciated. I do follow Place.To on Facebook and they did mention something about high resolution files being available now. I have also purchased from them on other sites. I hope you’re enjoying the high resolution update for your resources! If there is ever anything else I could assist you with please do get in touch. I’m always happy to help! I have several of the scene creator products but I am wondering if this update comes with the high resolution objects? Hello, I have this bundle also and I love it, so easy to use, but would love Aeriel views too, are you “bringing them out” in a similar package? I’m so sorry for any confusion but unfortunately there are no aerial view items featured in this pack. If you were looking for mockups that do feature this, we have some great ones available in our marketplace so I would definitely recommend checking it out! Apologies again for any confusion caused, Carrn! If you have any other questions or queries please do let me know, I’m always happy to help! This is an amazing package that has everything you could ever want or need. For me though, I am wondering if you would,could, in the future offer an aerial view point of the desk? I create and design stationery and your mockups would be absolutely perfect for me, just looking down on the desk. Please let me know if you offer something like this. Thank you kindly for getting in touch with your feedback! It’s great to hear you are liking the look of this pack but I can certainly point you in the right direction of some items that would be better suited to you 🙂 I’ve popped you a quick email with some more information on this. I hope it helps, Georgina, and please don’t hesitate to contact me should you have any other questions. I am always happy to help! Hi – is this the High Resolution version?